January 21, 2018 Events, Gallery Comments are disabled after 182 days. An atmosphere of awe, delight and curiosity filled The Gallery at Penn College on Thursday evening for the opening reception of “Books Undone: The Art of Altered Books,” the gallery’s first-ever national juried exhibition. A large crowd enjoyed perusing the imaginative creations, listening to an artist’s talk, and celebrating the pieces honored with prizes. “Books Undone” opens eyes to the artistry of altered books. Brenda Oelbaum’s “Results May Vary” was honored with the first-place award, with Deborah Stabley’s “History Repeats Itself” and Mary Larsen’s “Beauty Remains,” receiving second- and third-place awards, respectively. Honorable mentions were awarded to “Great Expectations: Loosely Knit,” by Gregg Silvis; “The Good Girl,” by Susan Lenz; and “Exorcism of Page 13,” by Caryl Burtner. Oelbaum, of Dexter, Michigan; Stabley, of Muncy; and Silvis, of Newark, Delaware, were among the artists able to attend the reception, in addition to O’Donnell, from Bloomsburg. The “Books Undone” exhibition, implemented entirely by The Gallery at Penn College, received over 190 submissions by 84 artists from 28 states. That exceptional collection was then narrowed down to 58 pieces created by 27 artists from 20 states being showcased through Feb. 28. The exhibit can be viewed during gallery hours: 2 to 7 p.m. Tuesdays and Thursdays, 11 a.m. to 5 p.m. Wednesdays and Fridays, and 1 to 4 p.m. Sundays. The gallery, on the third floor of the Madigan Library, is closed Saturdays and Mondays. A companion display of student and faculty artistry, “Old Books/New Lives: The Art of Upcycling,” is presented on the first floor of the library. Gallery Director Penny Griffin Lutz (at podium) welcomes the crowd to the evening’s celebration. Brenda Oelbaum’s first-place work, “Results May Vary,” is a short film of performance art showing the artist eating pages of a diet book. “History Repeats Itself” expresses Deborah Stabley’s concerns about our tumultuous times. 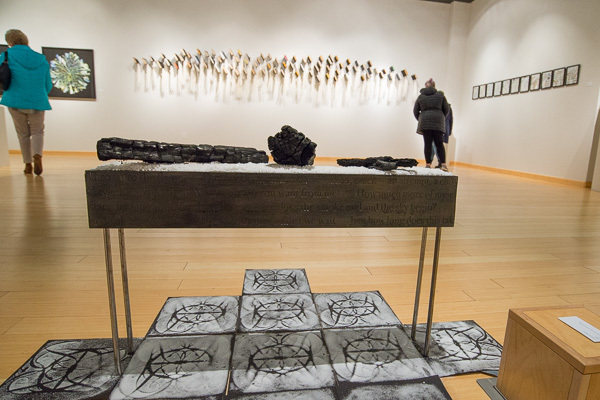 Capturing the second-place ribbon, the Penn College art faculty member’s work employs Raku-fired ceramics and burned books. Artists in attendance line up to respond to visitors’ questions. From left: David Stabley, Deborah Stabley, Jamie Hannigan, Brenda Oelbaum, Gregg Silvis, Doug Beube, Carole Kunstadt and Chris Perry. … by pairing particular Woolf works with water sources relevant to either the book or the writer’s life. Students study Perry’s “170 Ripples: scudding,” inspired by a front of misty clouds drifting quickly to shore. With his knitted piece hanging behind the dais, Silvis receives his “honorable mention” award from Lutz. Silvis used an entire copy of “Great Expectations” for his creation. A gallery visitor contemplates “The Emersonian Rose,” a low relief sculpture by Greg Lookerse. Using needle and thread for self-expression, Susan Lenz incorporates vintage and recycled materials for “The Good Girl,” an honorable mention recipient. “Combustibles,” by Julie Wills, employs wood, dictionary pages, hair and matches. Beube delivers the artist’s talk, offering insight into the craft of altering books. “Refugee Atlas 2016” is one of the creations by Heather Beardsley, who utilizes embroidery and cutwork on European driving atlases to map out locations of current refugee crises. Influenced by icicles, Perry’s “154 Ripples: icicle” flows with fabric, wood, aluminum, paper and altered books. Displays of dictionary delights warm a chilly January night. With an eye for intricacies, Hannigan’s “Harry Potter and the Sorcerer’s Stone” inspires magic and wonder. “Having a Ball with Sherlock Holmes – The Adventure of the Copper Beeches” is a playful take on altered books by Peggy Johnston. Seth Apter’s mixed media works invite exploration to find hidden treasures inside pockets (with gallery gloves provided to visitors who want to handle the books). “Sacred Poem LXII” is one of three works by Kunstadt, blending gampi tissue and pages from 1800s Parish Psalmody.